The Hanging Gardens of Babylon are usually listed amongst the seven wonders of the ancient world – yet as far as gardens go, they were missing one thing that would have made them even better: strawberries, a fruit that would not land on the shores of the old world for another couple of thousand years. It was a sad berriless time in human history, unless you lived in the Americas. I’m a huge fan of strawberries (maybe you guessed that), and, as a kid, I used to surgically remove their leaves (calyxes) to ensure that not one molecule of that sweet red flesh went to waste. I must confess, I’ve gotten sloppier as I’ve gotten older – but I don’t feel good about that. So, I recently started to wonder about strawberry tops, and what I could do with them. It turns out that many people use them in smoothies, or to make tea. One word of caution, though: the leaves of strawberry plants release hydrogen cyanide gas as they decay – and that’s not so good for you. So, if you want to use strawberry leaves, you either need to use them before they start to wilt, or after they’ve had time to dry out. After I made strawberry pancakes yesterday, I was left with a half dozen strawberry tops. Rather than waste them, I seeped them in hot water, and ended up with a light pink, fruity herbal tea. And after I was done soaking all the goodness out of the strawberries, the worms in the composter got a delicious snack that would have been the envy of His Royal Highness, King Nebuchadnezzar II. They seemed happy. This entry was posted in Waste less recipes and tagged eating green, leaves, smoothies, strawberries, sustainability, sustainable living, tea by Jean-François. Bookmark the permalink. Lovely! I nibble them off and spit them into the grass (sorry, but at least they’re fertilizer), also as not to waste a single micron of fruit. I ate some leaves once (picked straight off the plant) but did not like the flavor, so not again. 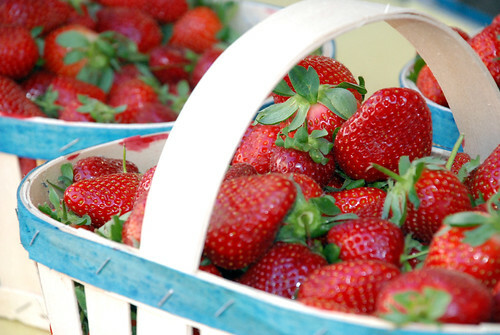 We’re still picking strawberries at our local farm through May 13th. Much sweeter this year since we’ve had rain. The drought was horrible on them last year. We freeze 3-4 gallon-bags of them every year to keep us stocked up until picking season starts next year. Just as sweet out of the freezer (we remove stems and leaves first). BTW, do you see my like-button yet? Just curious…they’re working on it. Yup, I even “liked” that your like is back. I saw that! Thanks. May be a berry-picking kind of day. If we go, I’ll take some pics. Spitting strawberry calyxes into the grass ranks pretty low on the scale of environmental sins – and making tea doesn’t change their ultimate fate. I had never thought of making a tea with them. We do compost all our scrap veggies but I love this idea especially as I go through about 2 pints a week. It doesn’t change their ultimate fate, but it does mean you squeeze a bit more out of them before the worms get them – and in the process use fewer tea leaves. Good point about pesticides; in general I’m only comfortable eating greens from organic vegetables (most of what we buy is organic). And on a side note, I found the strawberries in the picture above in your neck of the woods (in an open market in Cannes), and just assumed they were local … a good reminder that it’s important to ask. Thanks much, Shannon. Seems these awards come with obligations, which I will happily fulfill on the weekend (just landed in Singapore, which means I have no life to speak of for 3 weeks). This is one obligation I’m looking forward to – it will be a good chance to highlight some of the writing I’ve been enjoying. And have fun in Singapore; my favorite city in the world, Sydney, Australia, being my 2nd. Thanks for the award and the bon voyage (just posted about the former). Singapore is up there on my list of favorites too. Great food, multicultural, clean, safe – there’s lots to like (except the long hours I put in here :) ).